Peter Owen Jones dropped out of public school at the age of 16 and went to Australia to make his fortune. Returning to London, he started in advertising as a messenger boy and worked his way up to creative director. ;In his late 20s and with a wife and two children, he gave it all up to follow a calling to the Anglican ministry by enrolling at Ridley Hall, Cambridge. He charts the many battles he had to fight on the road to ordination and the many varied characters who people this world largely unimagined by the majority of the British public. ;With the eye of an outsider he observes the arguments that rage between evangelicals, Anglo-Catholics and liberals. He chronicles the highs and lows of the college football team. And, above all, he bears witness to his vision of God that has led him to this place which leaves him not a little sceptical of the role of the Church today. ;Peter Owen Jones is now a curate in a remote Fenland village. In early 1996 he gained a certain notoriety when he conducted a service for the Newbury by-pass protestors. - Publisher Peter Owen Jones is a curate in a remote Fenland village. 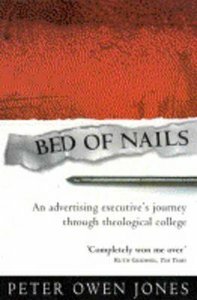 This is the account of his ordination through an Anglican theological college, after dropping out of public school at the age of 16, and going to Australia to make his fortune. Peter Owen Jones is a curate in a remote Fenland village. This is the account of his ordination through an Anglican theological college, after dropping out of public school at the age of 16, and going to Australia to make his fortune. Rev. Peter Owen Jones is an award-winning broadcaster, writer and non-stipendiary priest. He ran a mobile disco and worked in farming and advertising before discovering his true vocation. In 1996 he came to public attention when he conducted a service for the Newbury by-pass protestors. He is the vicar of three parishes in Sussex and a trustee of the Arbory Trust, the first Christian charity to offer woodland burials.